XNSPY Official Blog > parental > How social media is fueling eating disorders in teens? While social media platform alone isn’t the only reason for developing an eating disorder, it can play an adverse role in accelerating the risk of eating disorders among teens. 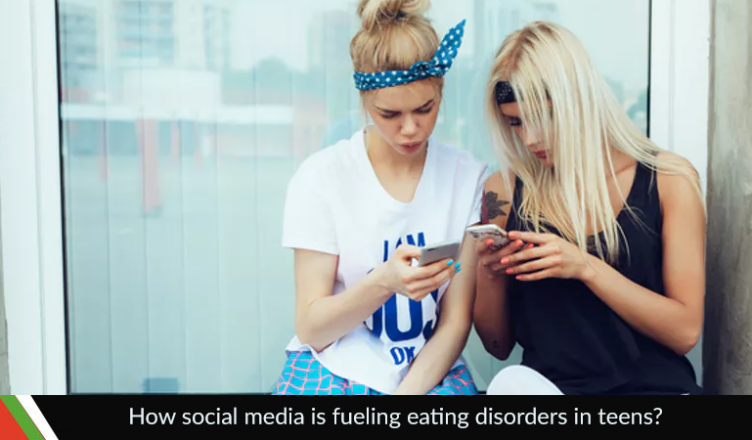 It’s an issue that has to be addressed, but first, it requires to be known how social media is encouraging eating disorders. If you are a parent, you better well read this blog till the end because we all know that children are more likely to experience the ill effects of social media than any other age group. Anorexia is a life-threatening eating disorder. Those suffering from eating disorders place a high value and use extreme efforts in controlling their weight and shape. People with anorexia severely limit the amount of food they eat to lose weight. It isn’t really about food—rather it leads to a psychological state where the sufferers compare thinness with self-worth. A distorted perception of weight. There are two common types of anorexia: Binge and restrictive. Binge types of eating disorder causes irrational fear of gaining weight in the sufferer right after eating leading to excessive exercise, vomiting or abusing purges. On the other hand, people suffering from restrictive anorexia consume far fewer calories than are required to maintain a healthy life. They are often perceived as highly self-disciplined. They restrict the quantity of food leading to a form of self-starvation. Here is an important article for you to learn more about anorexia. In 2018, the frequency of social media users worldwide is 3.196 billion, with an increase of 13% every year. The research shows that we spend almost one-third of our lives online. According to a recent study, 95% of U.S. teens have access to a smartphone and it is important to note here that 45% of teens are online almost constantly. Other than Facebook, three online platforms – YouTube (85%), Instagram (72%), and Snapchat (69%) – are widely used by U.S. teens. 78% of 18-24-year-olds use Snapchat and 71% of Snapchat users visit the site several times a day. In 2011, Laura Willmott, a girl from Bristol, aged 18, died of anorexia eating disorder. The eating disorder has nothing to do with the age, gender, race, ethnicity or cultural background. Eating disorders have the highest mortality rate of any mental illness. The risk of eating disorder in the group of girls 15 to 18 years old is increasing and the mortality rate is 12 times higher than any other cause of death among this age group. According to research, every 1 in 5 anorexia deaths is by suicide. In the last three years, the frequency of teenagers being treated for eating disorders has alarmingly doubled. The pressure from social media is identified by the experts as a significant factor behind this rising trend. According to the National Eating Disorder Association, 4-10% of male and 10-20% of female college students in the U.S. are suffering from eating disorders. Social media platform is used for the promotion of eating disorders. KiK, a popular app among teenagers, is being used to promote eating disorders with a number of pro-anorexia groups. Another popular social media website, Instagram is being used to sell diet pills containing the banned substance. How social media and eating disorders are linked? Social Media use in 2018, a research published by the Pew Research Center shows that social media has a significant impact on society. Spending time on social media sites develop unhealthy eating habits. FSU’s mental health specialists claimed that spending just 20 minutes on social media a day accelerates the fear in a woman about shape and body leading to anxiety and depression. Despite growing knowledge and awareness of eating disorders, social media plays a more negative role as it has a strong impact in the daily lives of teens. In the digital age, pictures on social media, many of which are filtered or airbrushed, have become a validation standard for teens. They estimate self-worth by the number of likes and comments they receive on social media. “Skeletal selfie” has become a strong parameter and individuals decide after the picture if they are going to eat that day or not. Selfies on social media sites send a potent message that the self-worth is determined by body and weight. The comparison can be toxic for teens suffering from eating disorder as they compare their body images with others on social media to evaluate their self-worth. They compare themselves with the people they perceive to be thinner or fit. They usually criticize and berate themselves for not being as thin as others. There are a number of posts on social media telling about weight loss, exercise routines, diet plans, and unrealistic pictures of ideal body sizes. For example, there are many posts showing before and after weight loss photos, such posts trigger the need to lose weight instantly by any means. How you can minimize the risk of an eating disorder? Can we use the internet in a safe and beneficial way to protect ourselves? The answer is: Yes. The most important rule to minimize the risk of social media triggering to an eating disorder is to be mindful and aware. You have to be mindful of the composed nature of social media. You must be mindful of the fact that picture or post you are viewing on the internet is posed and edited to be perfect. Everything you see on social media is a Façade with concealed fragilities. You have a right to block people, report content, and filter options on social media sites to tailor your Newsfeed. Whenever you feel that the content is overwhelming, use your mouse pad and press the cross button. You can try to protect yourself, and reach out for help and assistance before it is too late. Parents, you should be extra vigilant by setting restrictions for children and teens who have access to smartphones or other devices. Look for the symptoms of eating disorders before it is too late. You should be more alert with children or teens who are already suffering from health issues like depression or eating disorders. So, now is the time for you to monitor the online activities of your children on social media sites, track their online move, and make sure they aren’t getting themselves in trouble.